Disney World. The mere words have been stirring up all manner of magical fantasies for generations of kids and big-kids, so I don’t know who was more excited – the children or us – when we hopped on a train to the airport and finally revealed to 7 year old JD and 3 year old Jay that we were headed to Walt Disney World, Florida. Their smiles lasted the whole trip. If you don’t already know, while Disneyland Park was built in California in 1955, Walt Disney World is in Florida and was built in 1971 . 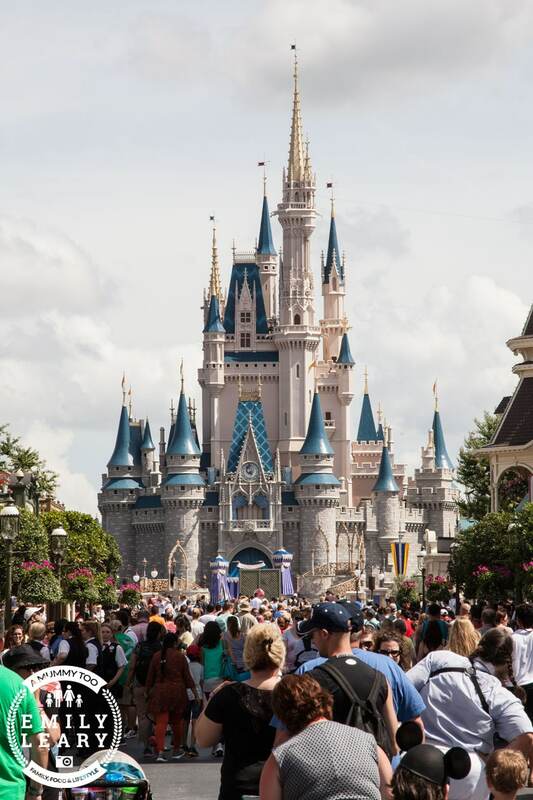 Located 20 miles southwest of Orlando, Walt Disney World is bigger and has more to offer than we could have possibly imagined. Naively, I was expecting a single theme park, perhaps divided into sections, but Walt Disney World is actually a vast collection of separate, self-contained theme parks (Magic Kingdom, Disney’s Hollywood Studios, Disney’s Animal Kingdom Park and Epcot) plus two water parks (Typhoon Lagoon and Blizzard Beach) on one huge expanse of land. There are 34 separate hotels, five golf courses (with 81 holes in total), a wedding pavilion and the ESPN Wide World of Sports Complex which holds pro and amature athletic events year round. 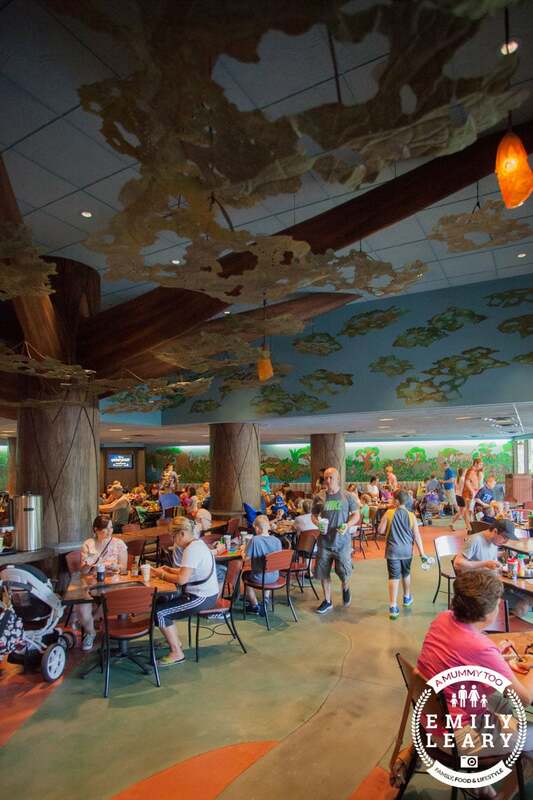 Finally, there’s Downtown Disney, which is a free complex open to the public and full to the brim with shops, restaurants and entertainment, all sitting within the Disney World resort. In the week we were there, we managed to cram in visits to all four of the theme parks and one of the water parks. We were there with the primary aim of seeing how Walt Disney World suits younger children and in particular, preschoolers. 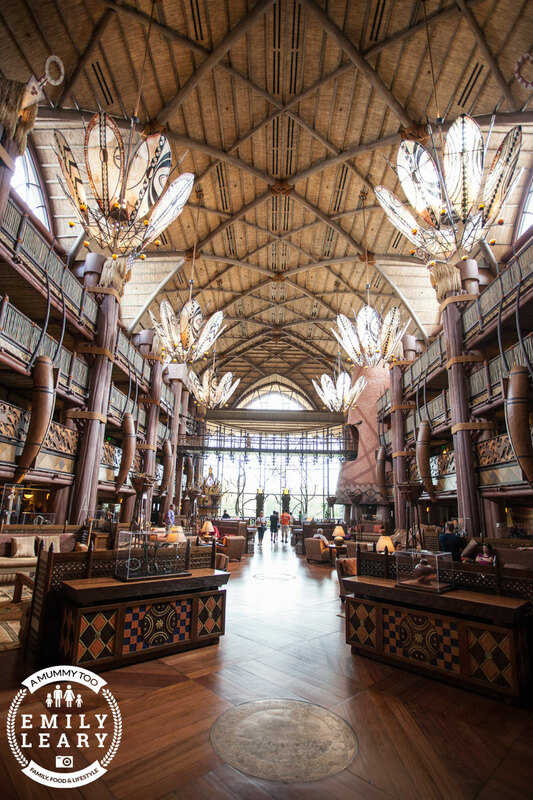 Each park was so magical in its own way – so exciting for both JD and Jay – that I soon realised a single article wouldn’t even begin to do our adventures justice. 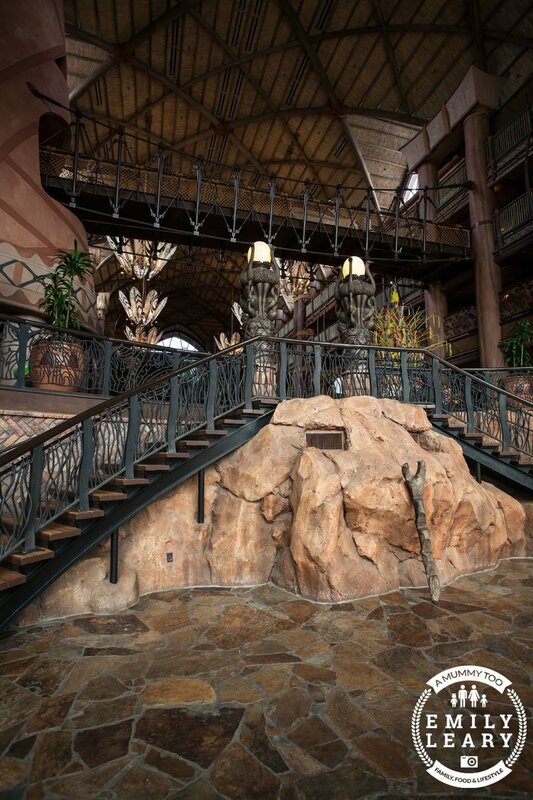 As soon as you walk in from the hot Floridian air into the cool air-conditioned lobby of Animal Kingdom Lodge, the view is breathtaking. 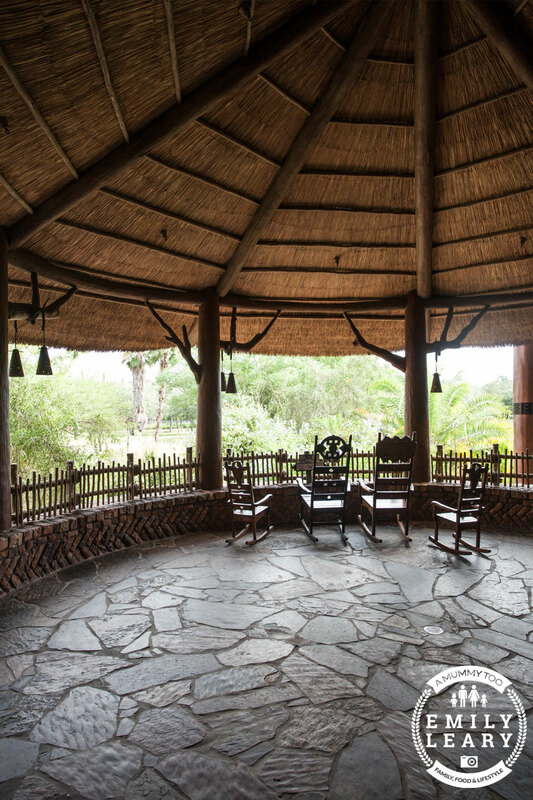 The entire resort is modelled on African architecture and design, combining rich decor and lots of ornate, hand-carved furniture. 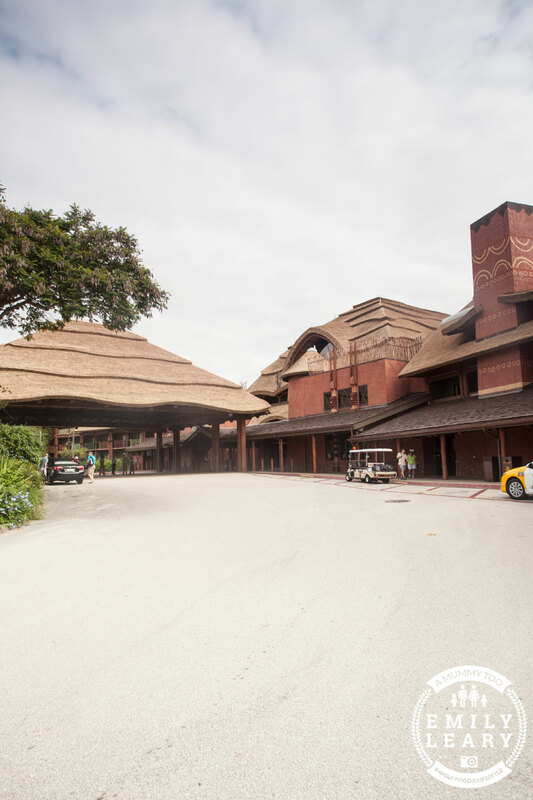 And this look isn’t just a theme park imitation – the hotel in fact houses one of the largest collections of African art anywhere in the United States. As such, the kids never got grumpy or fidgety waiting to head out on the day’s adventures – the lobby was a source of entertainment all by itself. 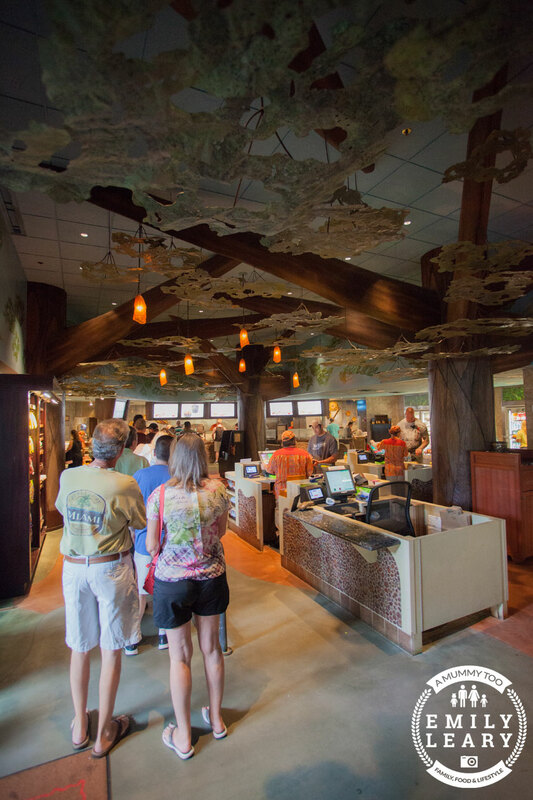 You can see why Disney classify Animal Kingdom Lodge as one of their Deluxe Resorts. But while the inside of the room was lovely, it was the outside we couldn’t wait to explore. 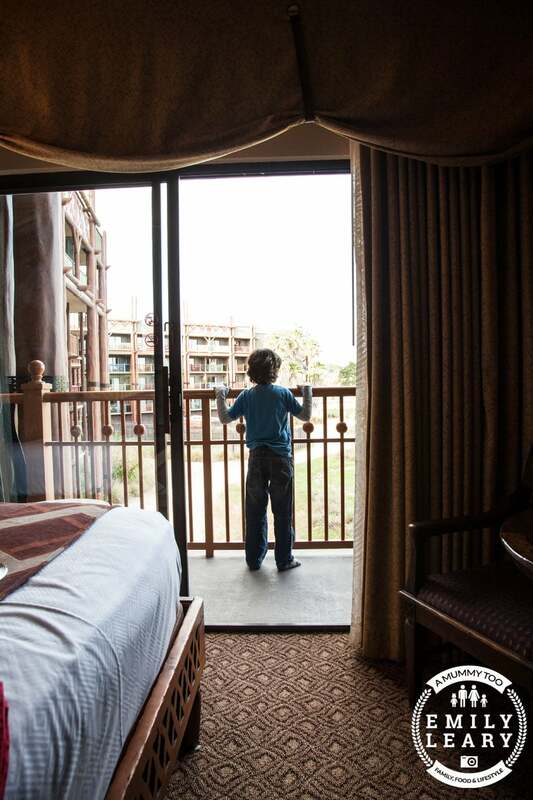 As soon as we checked in to our room, we headed out to the balcony to stare in genuine amazement at the view. 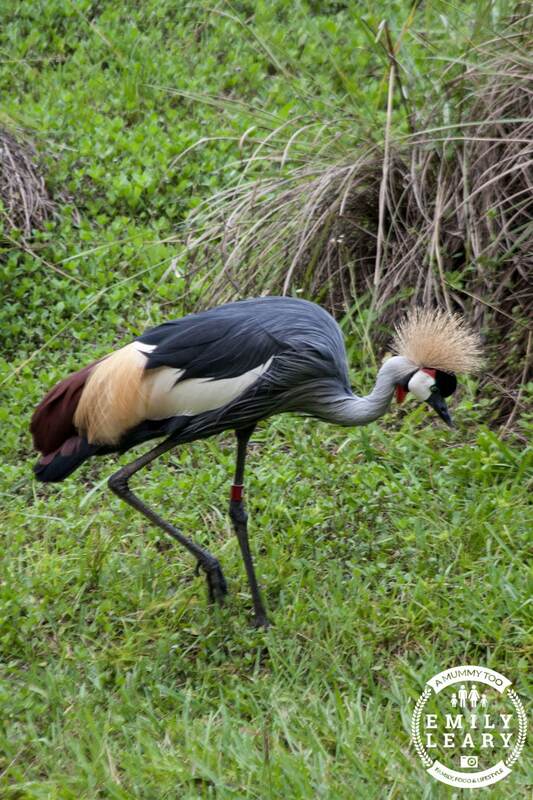 Surrounding the resort is 110 acres of simulated African savannah, which includes an amazing variety of wildlife. 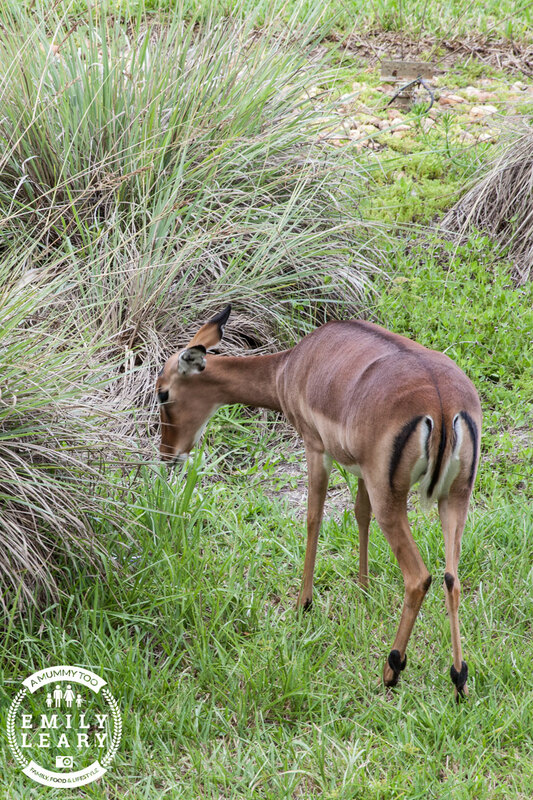 Over 30 species of African wildlife including giraffes, zebras, bison, gazelles and flamingos wander the savannah and we could see many of them from our own balcony, just meters away. These shots were taken from our room! 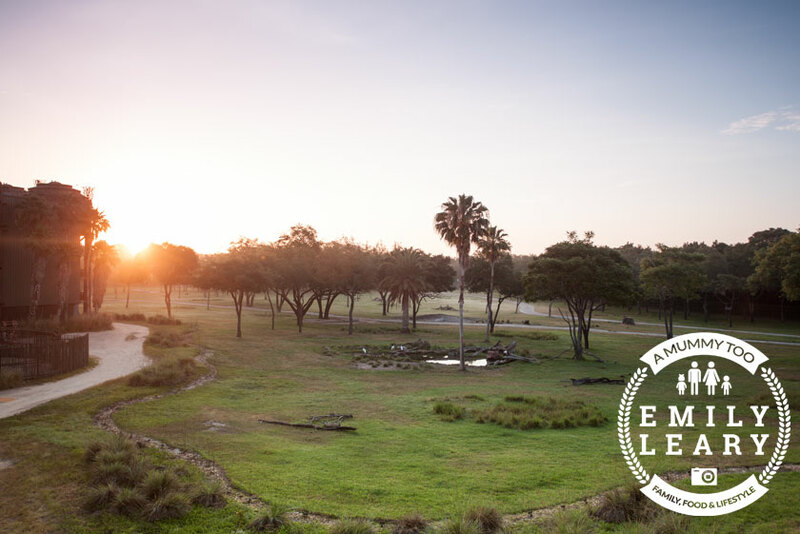 It was the most amazing experience, and I loved it so much, I got up before the sunrise most mornings, just so that I could sit on our balcony and watch the sun rise over the savannah as the animals gathered at the watering hole just outside our room. Should you be in a room without such an incredible view, there are lots of outdoor spaces where you can just relax and soak up the gorgeous sunshine and beautiful scenery. And if you have time, you can also choose to book a safari, where staff will take you out to see the animals at even closer range. Highly recommended. 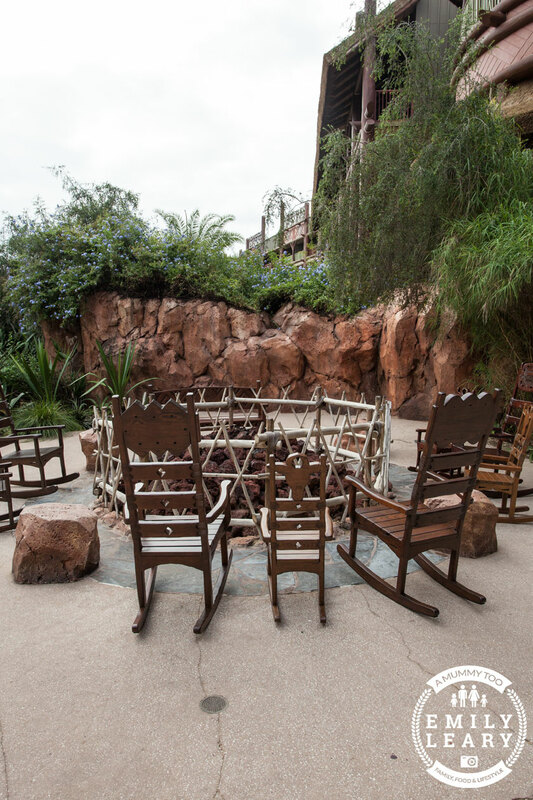 Breathtaking views aside, another enjoyable aspect of staying at Animal Kingdom Lodge was the food. 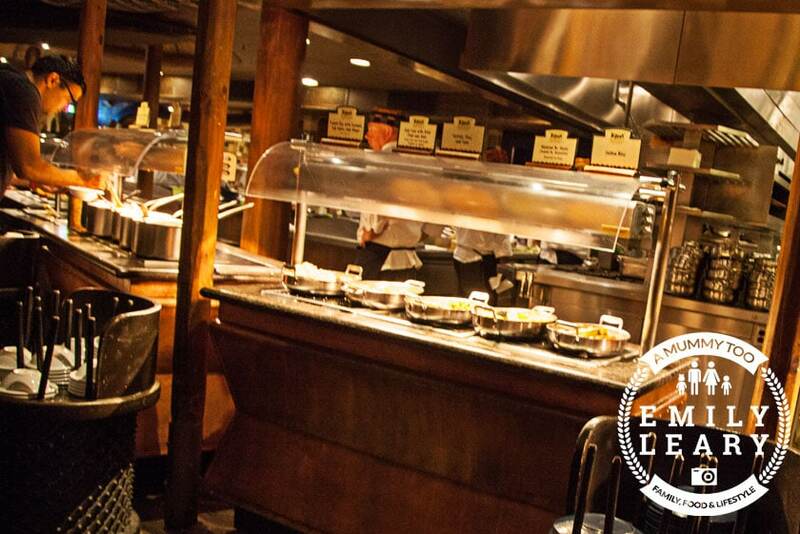 There are a wide variety of restaurants operating in the resort, and we took full advantage. 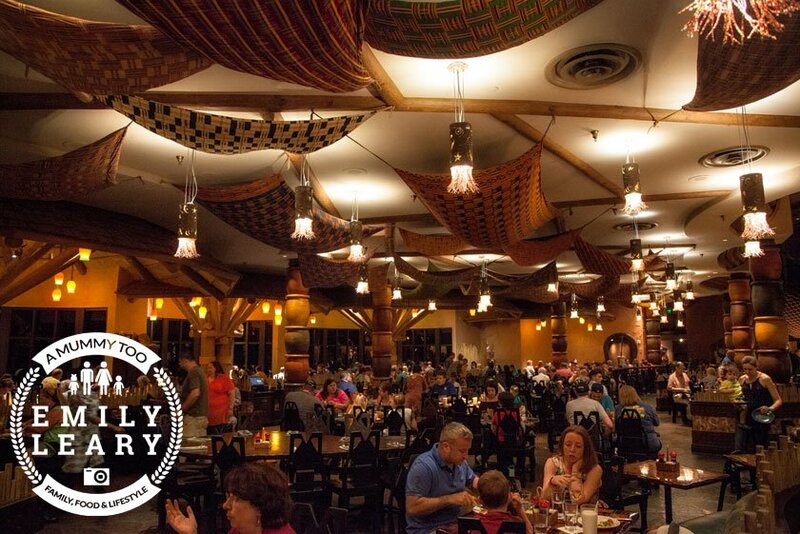 If there’s a staple restaurant when you’re staying at Animal Kingdom Lodge, it’s Boma. 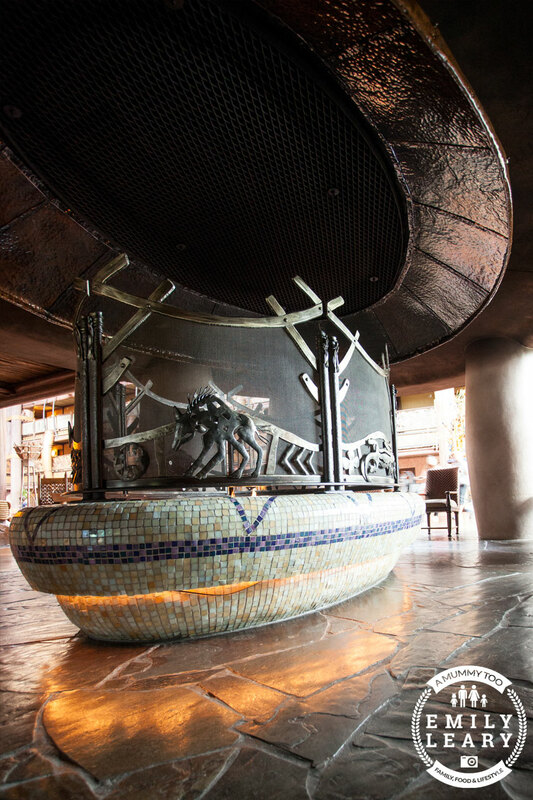 Designed to resemble a lively African marketplace, Boma offers buffet dining at breakfast and dinner. 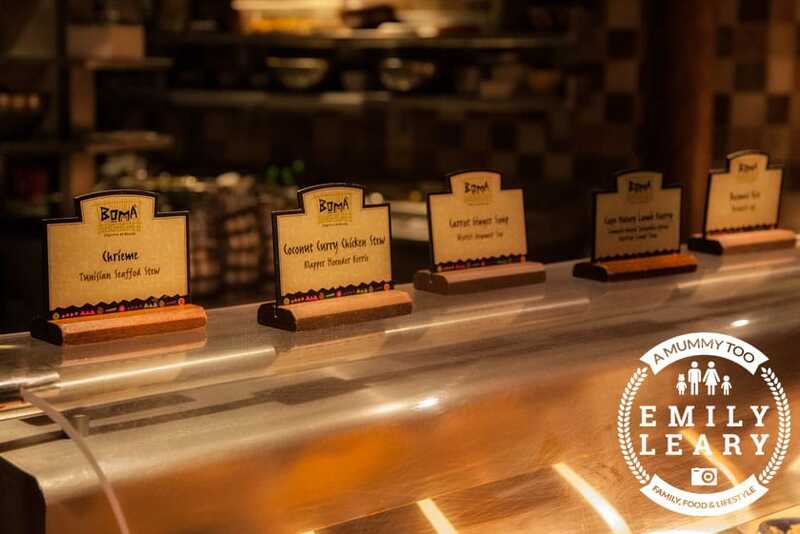 With an extremely well stocked buffet, Boma serves African dishes from over 50 African countries along with a selection of classic American dishes. It’s really great fun, the quality is well above average, and there’s something for everyone – from authentic African dishes to tempt your tastebuds to ‘safer’ options for less adventurous diners. 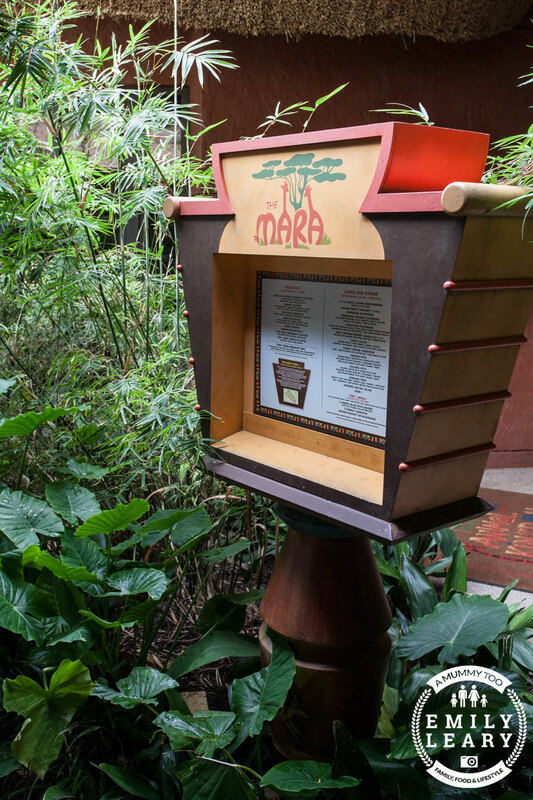 When we were heading out to explore and wanted to grab food on the go, then The Mara was ideal. Located just off from the main pool, it’s a canteen style eatery offering fast food based on African dishes and American classics. We grabbed a bite there a few times, opting for fresh pastries and juice at breakfast, and flatbreads or mac ‘n’ cheese at dinner. 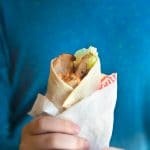 It’s simple and tasty fast food. 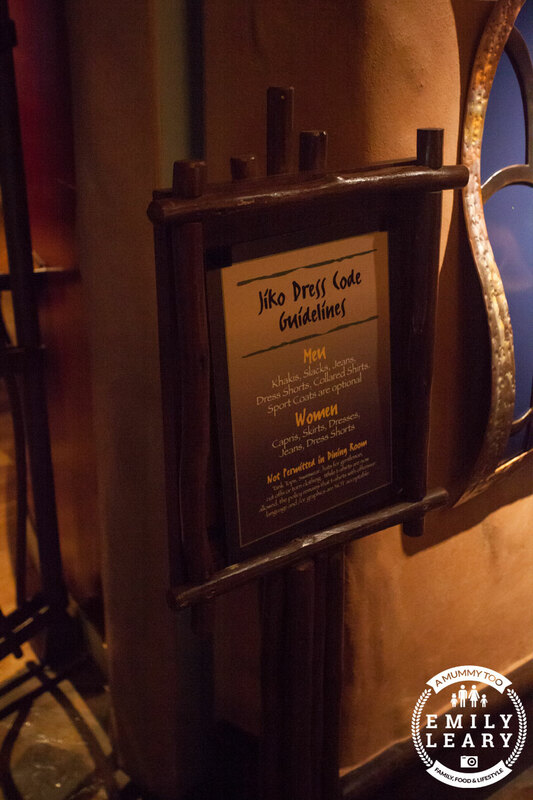 Jiko is Animal Kingdom Lodge’s premier restaurant so if you’re in the mood to spoil yourself with a more formal dinner during your trip, Jiko is the place to go. Do remember to book though – it gets busy. 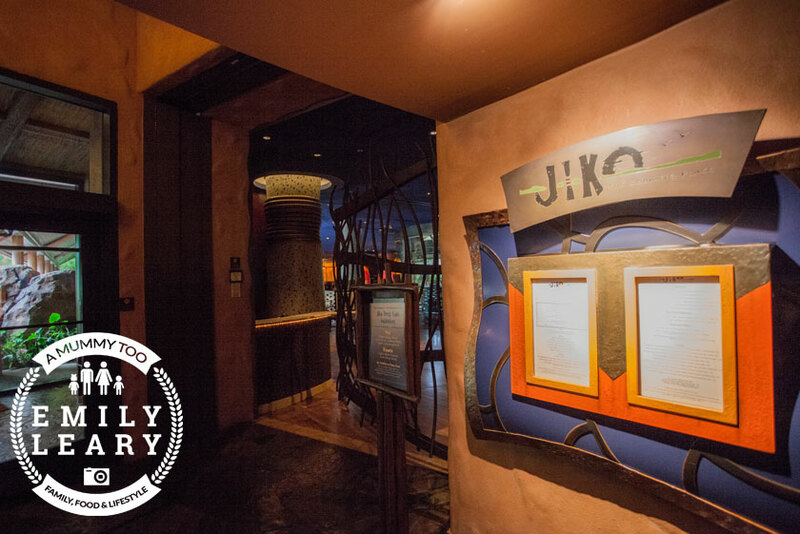 Jiko serves exclusively African food and African wines. 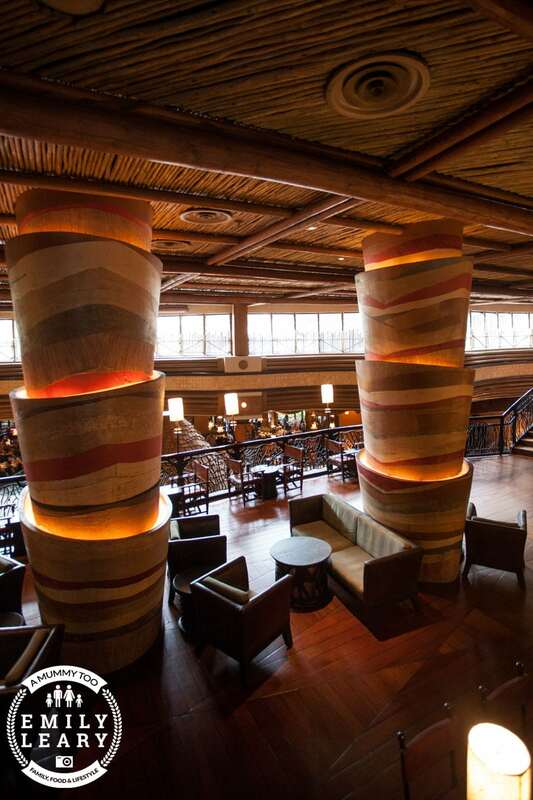 The decor is full of character and our favourite feature was the back wall which transforms, changing colour throughout the night to represent the setting sun on the African savannah. As a veggie, I was really pleased with the choice on offer. I tried some amazing Vegetable and Tofu Sambusas (samosas) served with tamarind and rice, as well as a gorgeous Roasted Cauliflower Flatbread, topped with bhuna masala, roasted cipollini onions, lamb chopper cheese, and mitmita gremolata. 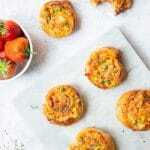 Moreish, well-spiced, filling and absolutely delicious. If this all it sounds a bit spicy for younger children’s tastebuds, never fear. There’s a kids menu that manages to tread the fine line between maintaining the tone of the restaurant and offering food that the kids enjoy, with choices such as grilled chicken breast with vegetables and fresh fruit, or macaroni & cheese. Should you wish to enjoy a meal child-free, there resort also offers a pretty comprehensive in-room babysitting and kid’s club service, although we didn’t try it out. 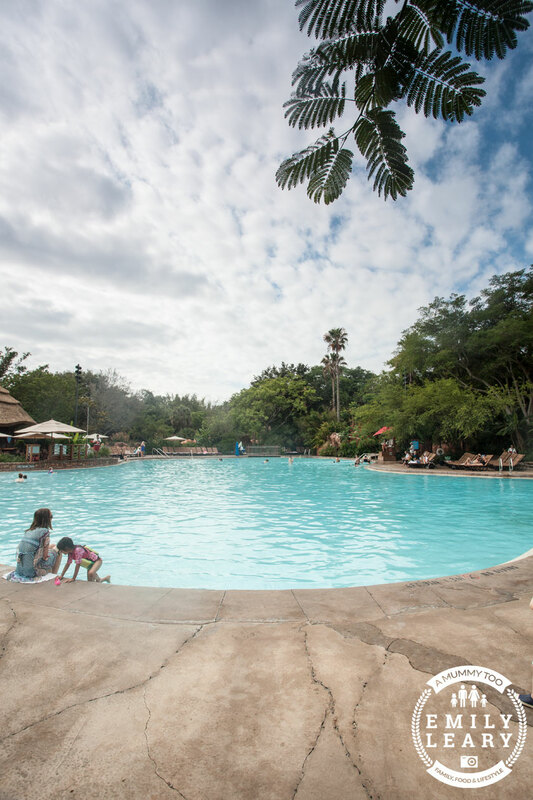 We absolutely loved the hotel’s Uzima pool – a beautiful 11,000 square foot pool attached to the resort that proved a gorgeous way to cool off in the late afternoon after a day under the baking sun. The main entrance to the pool is sloped and non-slip, so it feels almost like a beach and is easy for young children to walk into at their own pace. 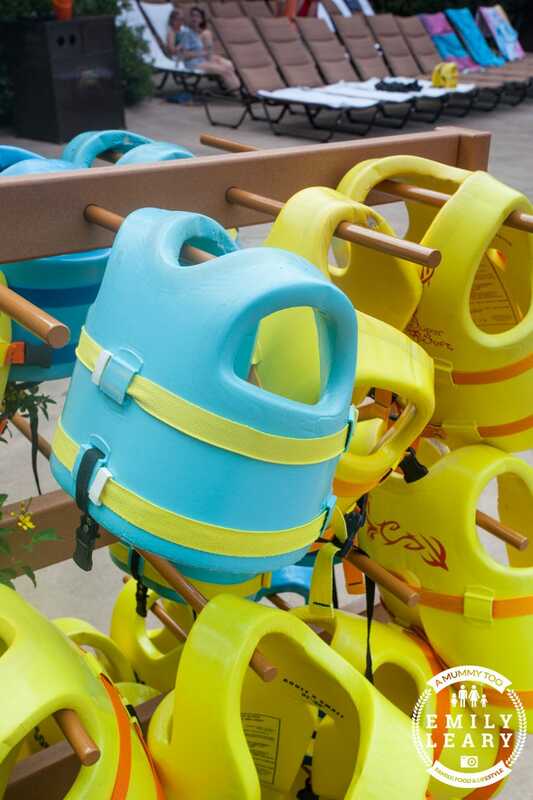 If your little ones aren’t great swimmers, you’ll be pleased to know there are plenty of well-fitting flotation vests available, so Jay, who can’t swim yet, could splash around quite safely and doggy paddle between us. 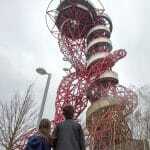 Both kids even tried out the waterslide, with Mark at the top and me waiting at the bottom. 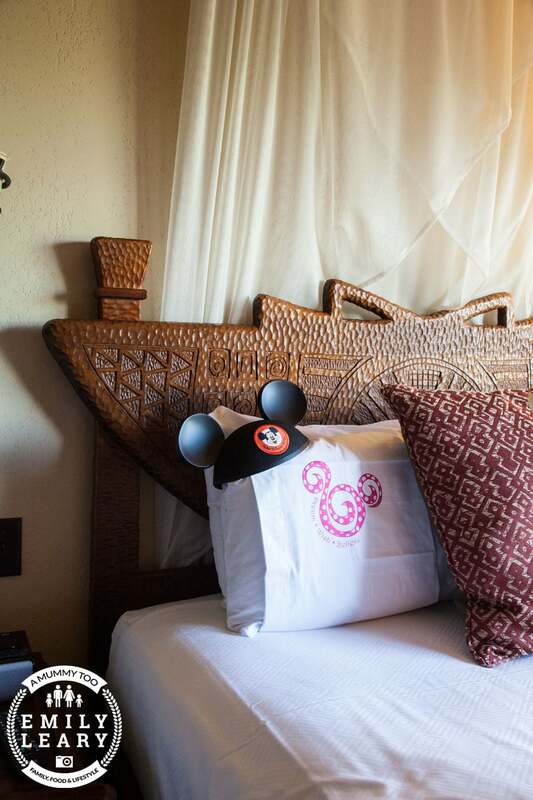 Looking back, I think we could have easily spent a day at the hotel, not even venturing into the parks and been perfectly happy. More than happy, in fact. The food is great, the rooms are cool and comfortable, there’s plenty of wildlife to spot, and the pool provides hours of fun. But of course, I’m glad we did venture out, because what we discovered in the parks was even better. We live in Miami and love going to Orlando to enjoy all the parks and fun out there. Plus, it is only 4 hours away so it works as a mini-vacay. 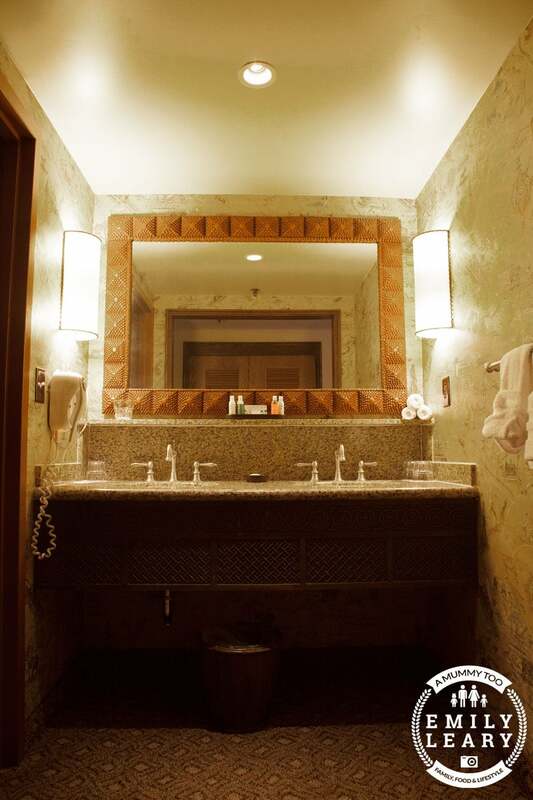 Thanks to your pictures and reviews this would be a place that we will definitely check out! This is the place I would love to take the kids with a room with a view, its a dream but one I hope we can be treated to in years to come. Your pictures make it look fab! OMG you are incredibly lucky to have has this experience – I absolutely adore Disney so much. 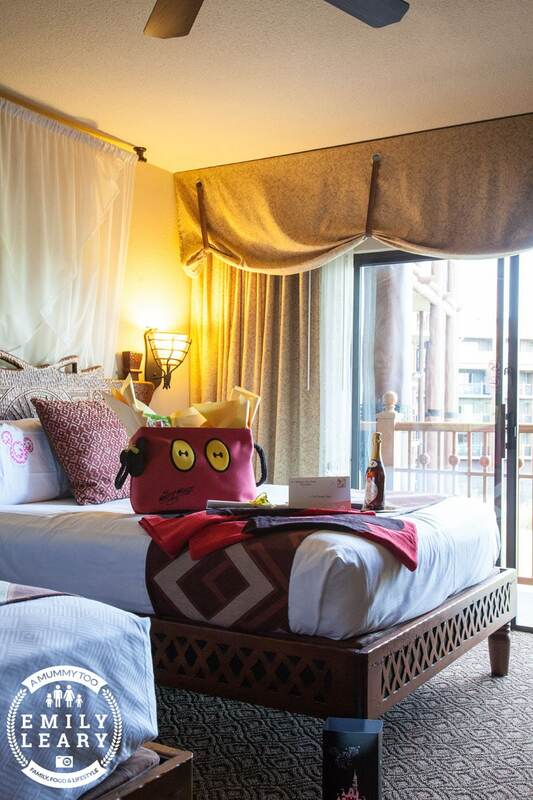 Your hotel and the room looked totally amazing! WOW. We are planning a big family trip to Walt Disney World next year and I can’t WAIT. It’s changed so much in the 18 years since I was last there. Awesome post – can’t wait to read more from you! 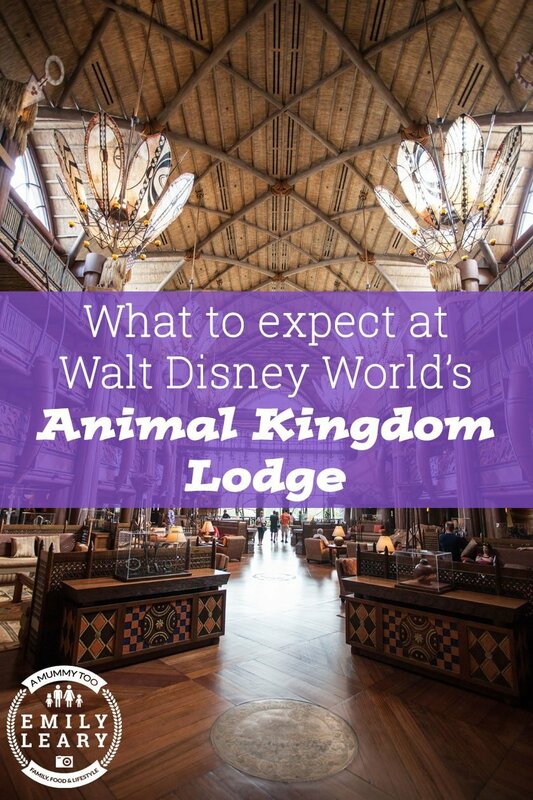 Animal Kingdom Lodge looks amazing and it was one of our short-listed hotels when we were planning our holiday. 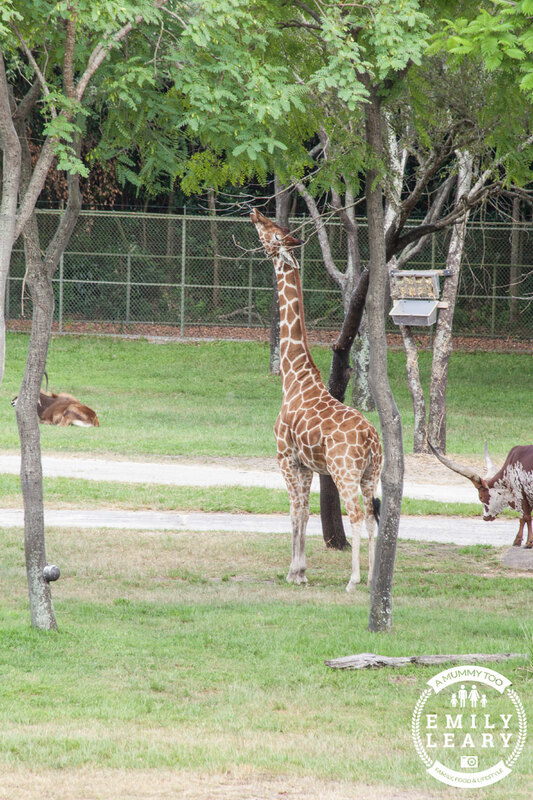 I’ve heard great things about the restaurants there too and how amazing to wake up and see the animals roaming freely through the grounds. Can’t wait to read part two. If Disney are reading this, I can’t wait to come stay with you in October ;) lol.